This classic Italian bread is simple to make and a delight to eat! Great with soup or on its own dipped into some Pomora extra virgin olive oil. Mix the yeast with 100ml of hot, but not boiling, water and leave for 5 minutes until bubbling. Add the yeast mix and another 250ml of hot water to 300g of the flour. Mix well. The dough will be very wet at this stage. Cover the dough with cling film and put it in the fridge overnight. Add the remaining 300g of flour, the flavoured oils and the sea salt to the dough and mix/knead for 10 minutes until the dough is smooth and springy. Leave to rise for 1 hour. Press the dough into a flat baking tray and press half of the chopped herbs into it. Cover with a clean tea cloth and leave to rise again. Once it has risen, make several indentations into the top of the bread with your fingers or the end of a wooden spoon. Drizzle a little Pomora extra virgin olive oil over the top. 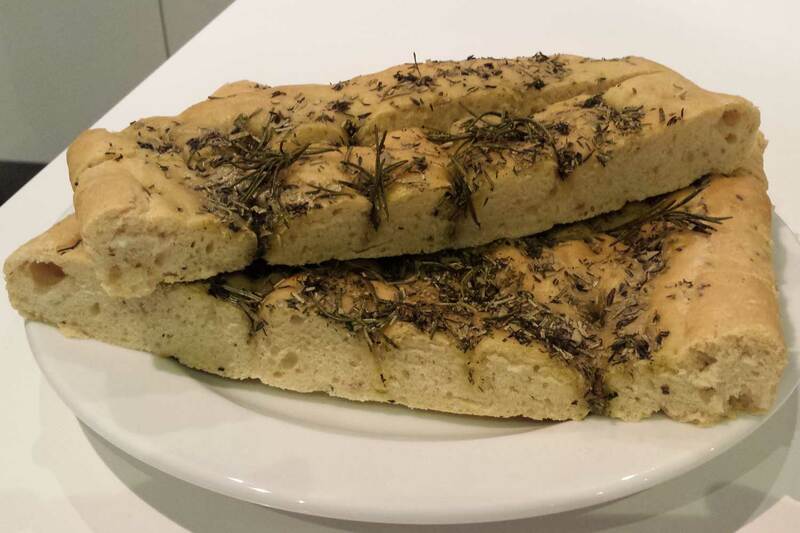 Place a shallow tray of water in your oven and place the focaccia on the shelf directly above. Bake for 25 minutes at 200 degrees Celsius. After 25 minutes, remove the focaccia from the oven and sprinkle over the remaining herbs and a splash more Pomora extra virgin olive oil. Bake for a further 15 minutes until golden brown. Goes perfectly with soup or on its own dipped into some Pomora extra virgin olive oil.